Deadline. In general, the copy deadline for each issue is the Friday 10 days in advance of the Monday cover date. The deadline for the Bulletin that covers May 31-June 13 is Friday, May 21. A complete publication schedule is available at deadlines or by calling (609) 258-3601. Princeton NJ -- Anyone who has attended Commencement at Princeton in the last 15 years could not help but notice Professor John Fleming. He is the towering figure at the head of the academic procession who calls the ceremony to order, his commanding voice and formidable presence perfectly setting the tone for an event with centuries of tradition behind it. But chief marshal is just one of the dozens of roles that Fleming, the Louis Fairchild '24 Professor of English and Comparative Literature, has embraced at Princeton in a career that has spanned almost 40 years. He has served as master of Wilson College, chair of the English department, faculty adviser to the Undergraduate Honor Committee, director of the Program of Freshman Seminars and columnist for The Daily Princetonian, to name just a handful of the many positions he has filled. He has plunged thousands of students into Middle English in "Chaucer," a course considered a rite of passage for English majors during the 25 years that he has taught it. Throughout his career, he has produced scholarly work about medieval literature and other topics that has been marked by its originality and versatility. And now, he's about to add another title behind his name: emeritus. He plans to go to a part-time schedule for the next two years before retiring in June 2006. "John Fleming is such a complete Princeton citizen that it's hard to imagine the University without him," said Robert Fagles, the Arthur Marks '19 Professor of Comparative Literature Emeritus. 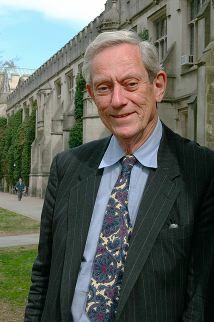 Fleming arrived at Princeton as a graduate student in 1961 after receiving a bachelor's degree from the University of the South. He studied at Oxford University as a Rhodes scholar, and earned his Ph.D. from Princeton in 1963. He spent a few years teaching at the University of Wisconsin before returning to Princeton for good in 1965. In those first years he was a preceptor for the course on 14th-century English poet Geoffrey Chaucer. "There was this great Chaucerian, D.W. Robertson, teaching the course, and I thought, 'Am I ever going to be teaching Chaucer?'" Fleming said. "But it was the best thing that ever could have happened to me, because it forced me to keep a very broad outlook." Michael Curschmann, professor of Germanic languages and literatures emeritus, called Fleming "a scholar of enormous creative energy and range. His work covers a great many medieval subjects from Chaucer to Dante and from Anglo-Saxon poetry to the Old French Roman de la Rose. And it elucidates such general phenomena as medieval monasticism; the character and influence of Franciscan literature down to Christopher Columbus; and the visual arts as a dimension of literary traditions." In 1980 Fleming took over the Chaucer course, treating the 100 or so students who sign up each semester to his compelling style of lecturing. "He conveyed the beauty of and the craft behind the poetry with such precision, lucidity and wit that I could hardly wait to go back over the texts in light of what I had learned," said senior Elizabeth Valvano. "I never left a class of his without feeling that I had, in some way, become a better reader of literature." The class has gained "almost a cult status among undergraduates," according to Eduardo Cadava, associate professor of English. "He has managed to draw students from several disciplines to the study of medieval literature -- not the easiest thing to do, given the strangeness and foreignness of Middle English for our students. He brings sheer passion to the material." Fleming is characteristically self-deprecating when discussing the high marks the class receives. "There are a few writers who are so good that no professor can ruin them entirely, and Chaucer is certainly one of these," he said. Frank Ordiway, assistant dean of the college, was a preceptor for the Chaucer class as a graduate student and admired Fleming's distinctive lecture style. "It's incredible erudition with a folksy touch," Ordiway said. "He knows how to take difficult material and seize people's interest with it. He could teach a course on almost anything and students would come." Fleming has brought that flair to dozens of other courses over the years, including several in the Program in Humanistic Studies and the Program of Freshman Seminars. And he is always eager to tackle a new curriculum: This year he is teaching a course on medieval allegory for the first time. "Professor Fleming and dull moments cannot possibly coexist," said senior Marthe Casey, who decided to become a comparative literature major after taking Fleming's "Masterworks of European Literature" course. She also chose Fleming as her thesis adviser for her study of Carmelite mystical poetry. "My interactions with Professor Fleming have inarguably been the highlight of my years at Princeton," Casey said. "He has deepened my understanding and love of literature and showed me the virtues of true scholarship. And most importantly, he has been a personal example of exceptional goodness and integrity." Fleming's rapport with students led to his serving two separate tenures as master of Wilson College, from 1969 to 1972 and again from 1989 to 1997. Fleming was interested in the role of master because it offered more informal opportunities for teaching. "The teaching arena in the classroom is excellent but contained, and there are certain limitations," he said. "The opportunity to have lunch with a student is also very important." Vice Provost Katherine Rohrer, who was director of studies at Wilson during part of Fleming's tenure as master, recalled that as she headed to work every morning, she looked forward to hearing Fleming's witty commentary on any and all topics. "These rants entertained as richly as they provoked thought," she said. She also was impressed by the bonds he formed with students. "His resident advisers and minority affairs advisers adored his quirky leadership," she said. And she noted that while serving as master he remained committed to the classroom: "He refused to take the master's teaching relief because he was too dedicated to his courses and the students they served." Dean of the College Nancy Malkiel, who helps to select masters, said of Fleming, "He combines as impressively as anyone the special qualities that we prize in this faculty: extraordinary scholarly distinction, excellence in teaching, and deep commitment to education, broadly construed, both inside and outside the classroom." Fleming has had more than his share of leadership positions in other areas of the University, including chair of the English department from 1981 to 1987, faculty adviser to the Undergraduate Honor Committee for almost 20 years and service on most governance committees, including the Faculty Advisory Committee on Appointments and Advancements, known as the "Committee of Three," and the Faculty Committee on Examinations and Standing. "Princeton has been the perfect kind of place for me," Fleming said. "It's allowed me to do every kind of administrative job to the level I've wanted to do them." He also has embraced the job of columnist for The Daily Princetonian, a task that students asked him to take on in 1996. Some of his columns have been controversial, and most are shot through with Fleming's inimitable wit, trademark self-effacement and wry observations about life on the campus. In a recent column about the professional activities of faculty outside the classroom, he wrote, "Princeton students and Princeton faculty share a few hours of concentrated activity each week, but for the most part we lead lives radically and in some respects mysteriously separate. Despite the fact that I have taken an active interest in undergraduate residential life, serving twice as a college master, I still do not know what students do with most of their time. I do know that during many hours when I am asleep, they are awake, while during many hours that I am awake, they are asleep. It's simply hard cheese on me that some of those latter hours coincide with my lectures." "He is, next to Robin Williams, probably the funniest man alive," Fagles said. Fleming took the assignment with The Prince because he believes strongly that participation in student extracurricular activities by members of the faculty is "one of the special things about Princeton." Fleming often participates in a Wednesday night conversation group held by the Episcopal Church at Princeton University, an organization of students, staff and faculty. "He is a strong Christian voice on campus, often speaking out on issues of social justice," said Stephen White, the church's chaplain. "He enjoys engaging students in discussions about their faith." As Fleming contemplates his retirement, his future plans include working in the garden and traveling in Europe with his wife, Joan, an Episcopal priest who also is retiring. And he is hoping to get back to setting by hand the type for the 90-year-old printing press that sits in his living room, which he has used to print limited editions of medieval Latin poetry. He also intends to start a comprehensive re-reading of the works of Joseph Conrad, one of his favorite authors, as well as the novels of Charles Dickens and George Eliot, including several that he's never read. "I had all my students write a midterm evaluation in my Dante course, and almost all of them said that, now that they have read 'The Divine Comedy,' they realize how much there is still left to know about it. That's the way I feel," Fleming said. "Today I sat down with a nice edition of Milton, and I found myself seeing things in 'Paradise Lost' that I had never seen before. That's rather thrilling because it shows me that there are going to be wonderful things for me to pursue."